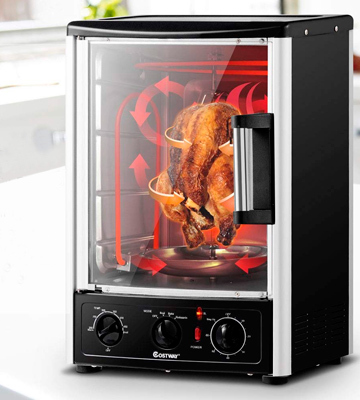 For an easy access to your cooked chicken, an exterior handle of the Ronco Showtime Rotisserie cooker stays cool. A removable heat shield will help you brown meat to perfection. You can't place it close to the walls because the housing may get hot. 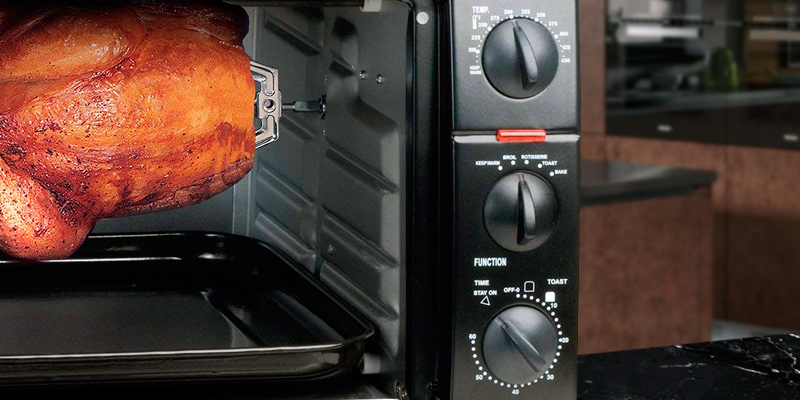 If you're always in a hurry and have no time for cooking, try this wonderful rotisserie oven! Two cooking positions allow roasting bigger or smaller chickens. 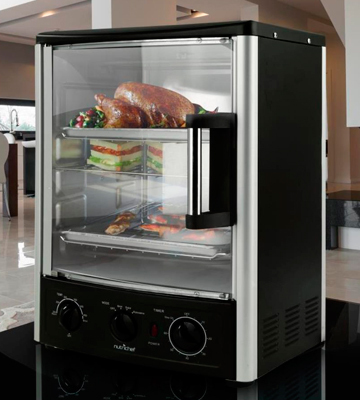 User-friendly and easy-to-maintain, this model will be a useful acquisition for any big family that loves to eat roasted chicken. 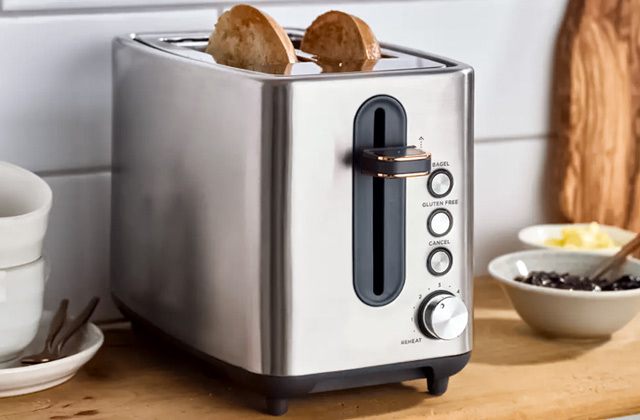 19.9" х 16.6" х 15.6"
A toast shade control of the Cuisinart rotisserie machine allows browning crispy toasts right as you love them. It is easy to bake even a frozen pizza with a Defrost function. Plus! The oven has 4 adjustable rack positions. The oven is rather bulky. Fast and efficient cooking of various foodstuffs is what you'll get thanks to the high capacity of this spit roaster oven. Its multiple settings will let you bring your culinary fantasies to life. 14" x 21" x 16"
You can roast meat on a skewer rack or prepare three dishes at once on a baking pan and two grill racks: adjustable dual heating elements and rapid air circulation will ensure even cooking of foods. 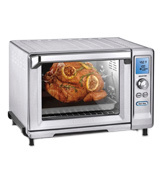 If you are looking for a reliable rotisserie oven at an affordable price, opt for this NutriChef model. Easy to operate, this multifunctional kitchen appliance is even easier to maintain. In addition to five pre-programmed settings and an assortment of accessories, the unit boasts an extra cooking surface on its top. You can use this oven-top grill/griddle for frying eggs, hot dogs, pancakes, or for warming foods. Numbers on the dials are somewhat small and might be difficult to read. Designed to serve as a toaster, grill, rotisserie, baking oven, and a griddle, the Elite Cuisine ERO-2008S can be also used as a steamer. With such a functional appliance at hand, it will be easy to vary your menu. 13.5" x 17" x 14.5"
Equipped with all the necessary spit-roasting tools and baking gear, the unit is both convenient and safe in use. 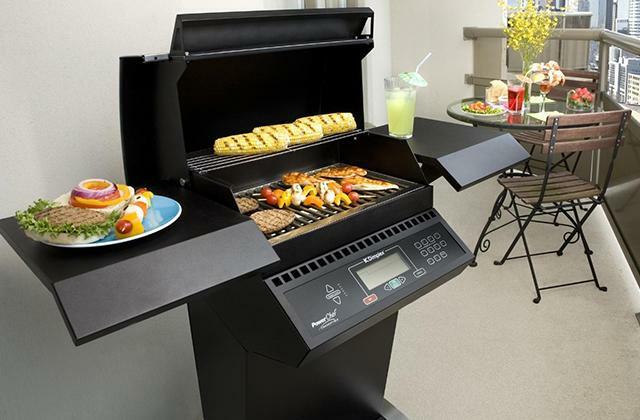 Besides, this indoor grill oven is simple to maintain: the accessories can be removed for hustle-free cleaning. Being rather lightweight, it might be a bit unstable. The Costway 23638US-CYPE is a functional rotisserie oven that can be used for baking and roasting fish, broiling and spit roasting poultry and meat, grilling vegetables and other foods. Adjustable heating elements and an ergonomic timer will allow you to follow more of your favorite recipes. 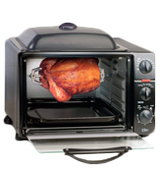 19" x 12" x 13.5"
This wonderful Ronco rotisserie oven boasts the highest quality possible. What makes it stand out from the crowd? First of all, the appliance uses 1/3 less energy compared to conventional ovens. Second, it is very easy to maintain: just wipe it with a damp sponge after use! 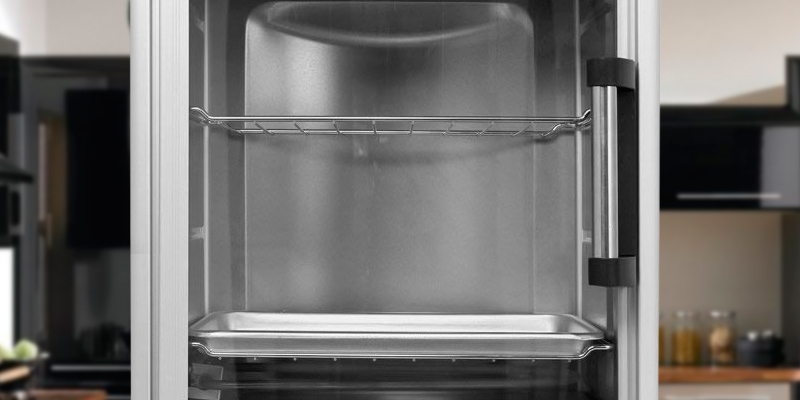 Both a removable glass door and a non-stick drip tray can be cleaned in a dishwasher. An exterior handle does not heat up, which ensures an easy and safe access to the cooked meals. And thirdly, it's easy to find place for it in the kitchen and easy to store in a standard cabinet due to its 13" height. Soft and juicy inside, fragrant and crispy outside, that's the type of meat this professional rotisserie cooker was designed to deliver. Owing to three cooking modes, you can rotisserie or sear poultry and after the chicken's already been cooked let the meat get saturated with juice, switching to the "no heat" rotation setting and leaving it like that for about 20 minutes. Rotisserie roasting is a way of cooking meat or poultry on a spit. The main advantage of this method is an even juice distribution provided with constant rotation. It is also used for cooking large pieces of meat or even whole pigs and turkeys. Roasting on a spit was very popular in the Middle Ages. As a rule, it was a "spit boy" who was supposed to sit next to the fire, turning pinked food around over the fire for its even cooking. First mechanical rotisseries were set in motion by dogs. Later, steam-powered and clockwork mechanisms were invented to provide a constant rotation of the cooked meals. The word 'rotisserie' has a French origin. It first appeared in the middle of the 15th century in Paris shops. These days, in some restaurants, there are special rotisseries or roast chefs engaged in cooking succulent roasted poultry and meat. 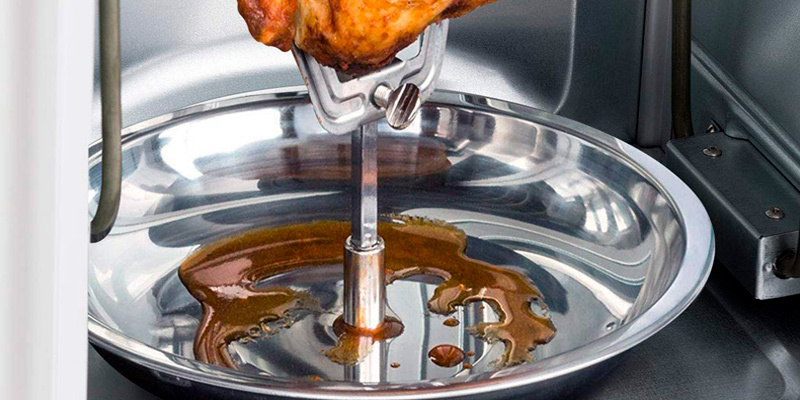 The rotisserie machine comes with comprehensive easy-to-follow instructions, tips and tricks for cooking an excellent chicken, and a selection of toothsome recipes. Moreover, in the box, you will find a multipurpose basket, a nonstick drip tray, food ties, and even a pair of BBQ oven gloves to protect your hands when you remove hot items from the oven. This rotisserie was just the right size for our family. Plenty of room for a nice size chicken or a small turkey. Clean up was easy. Between the non-stick parts, most everything -including the glass door is dishwasher safe. It's not surprising that people prefer buying rotisserie ovens with a bigger number of functions and accessories. 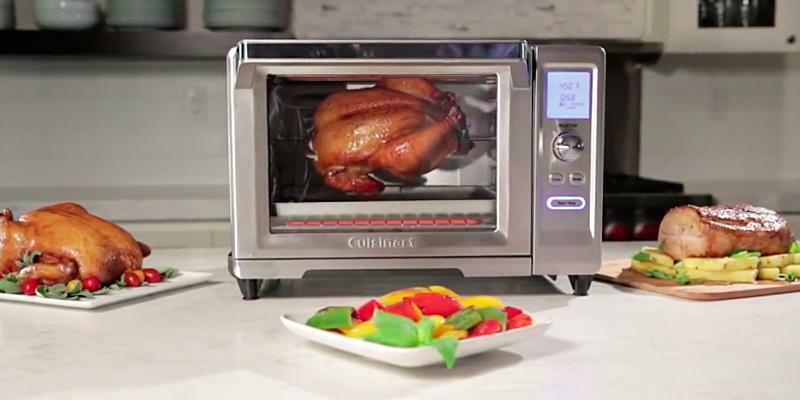 Cuisinart rotisserie oven is surely on top of the list with regards to functionality and performance. Besides beautiful stainless steel design tuned to fit any kitchen interior, the oven features an easy-to-read digital display with all the set functions and a selector dial to adjust temperatures and cooking modes. Here are about 12 settings which you can try out each day, cooking different meals, and a shade control (adjustable from 1-7 shades) to brown meat to the crust you prefer. This functional appliance can be used for various cooking tasks and replace many other kitchen gear allowing you to reduce the clutter on our countertop: the Cuisinart rotisserie oven performs the functions of a pizza maker, toaster and roaster well, delivering easy, intuitive control and safe but efficient performance. All that makes it a versatile and reliable kitchen assistant to cope with a number of daily taxing cooking chores. Juicy grilled chicken is a favorite meal of many people. Of course, you can buy it virtually from any store, but we have a better idea: you can try to cook it at home! Believe us, the taste buds of your family and friends will go crazy! You will need a lemon, pepper, salt, and curry. Rub a chicken with salt and spices, then put it in the fridge for 3 hours. Slice a lemon and put it in the chicken’s cavity. Do not forget to tie the poultry up before putting it on a spit! Fix it properly and put it in the oven. Choose the desired cooking mode and temperature. When the chicken is ready, pour some lemon juice on it (squeeze half a lemon). The meal is done. Serve the chicken with a vegetable salad. For those who'd like to simplify cutting jobs as well, we can recommend considering our picks of food processors, with the help of which preparing any kind of salad will be easy and quick. To make cooking foods as fast and efficient as possible, the Cuisinart TOB-200 is equipped with a convection function that can be used with all cooking modes. The hot air circulating around your foods will not only speed up the cooking process but also it will ensure more even baking, rotisserieing, roasting, broiling, and warming. 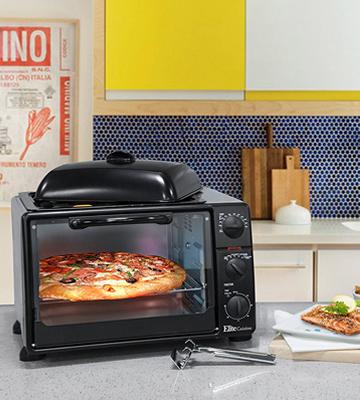 An advanced heating and cooking technology will allow you to "program" the size of pizza so that it's baked to perfection without burns, which is a super convenient option especially if you plan to use it as a pizza oven a lot. 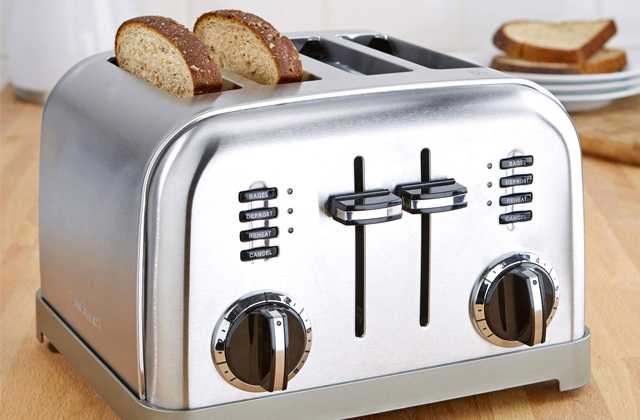 Using it as a toaster oven, you'll have an option to select the number of slices to optimize the cooking time so that they are evenly browned from all sides. Be sure, with the Cuisinart TOB-200 cooking any meal will be an easy and enjoyable process without fails. The size of the machine does not hamper the performance. Without further ado, the biggest selling point of the NutriChef PKRT97 is its beautiful design. Meals you'll cook in it will look so tempting as you brown them, observing the process through a glass translucent door will be nothing but pleasure. Yet the visually-appealing design is no the only benefit this oven has to offer you. Another great thing about it is that its tempered glass door is heat resistant, which allows it to prevent the heat from leaking into the kitchen. The hot air is not going to escape and will stay inside the oven circulating to ensure even cooking results. Operating the NutriChef PKRT97 is easy as anything. It has an ergonomic control panel with three dials for a cooking temperature, settings, and time adjustment. As for the cooking modes, there are three of them: bake, broil, and rotisserie. 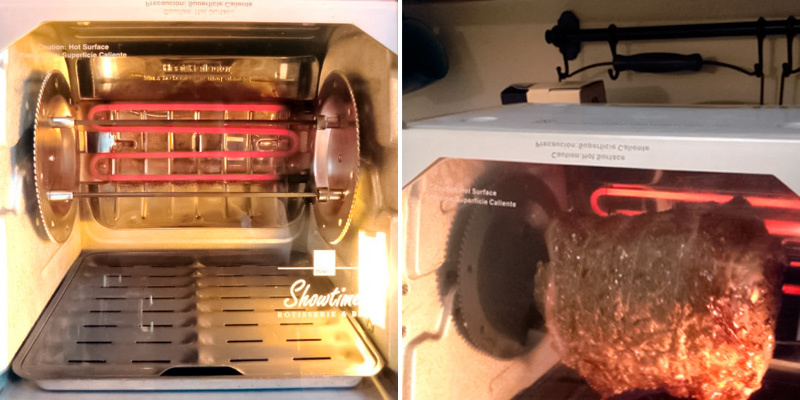 The good thing is, even if you've not used a rotisserie oven before, you shouldn't encounter any difficulties as the appliance comes with a detailed user manual where you will find many helpful tips as well as recommendations as to what temperature is best to use for a particular setting. 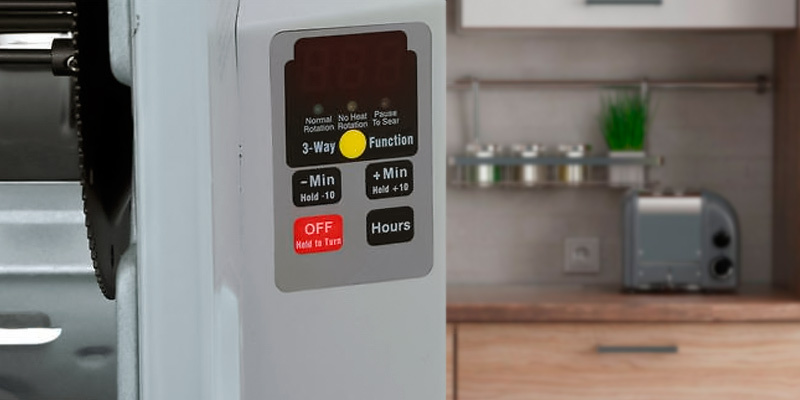 Also, the NutriChef PKRT97 has a timer that can be set for up to one hour or turned to a stay-on position, if longer cooking times are required. This energy-efficient rotisserie machine has two powerful heating elements that can be adjusted, depending on how you are going to use the oven, to ensure excellent cooking results each time. 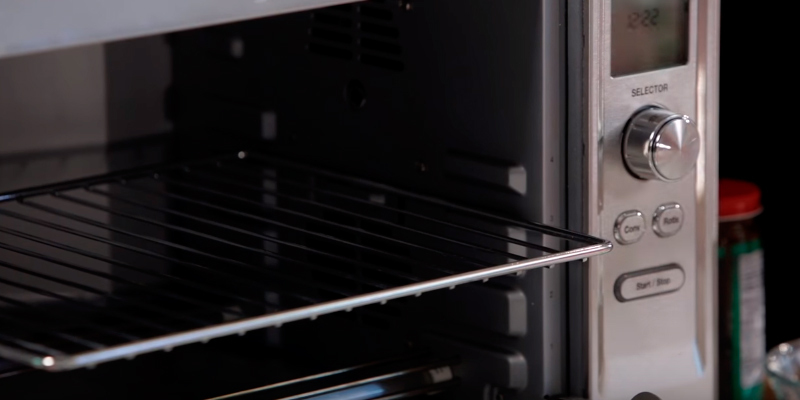 Fixed in a horizontal position in a BAKE/BROIL mode, the heating elements will allow you to use the appliance as a countertop toaster, baking, or a roaster oven. Meanwhile, a vertical position in a ROTISSERIE mode will allow the most effective spit roasting poultry, meat, and vegetables. Adjusting the heating elements is quite simple, just keep in mind that the appliance should be unplugged and cooled down before you do it and make sure they are securely locked in the locking tabs before you plug the unit in. 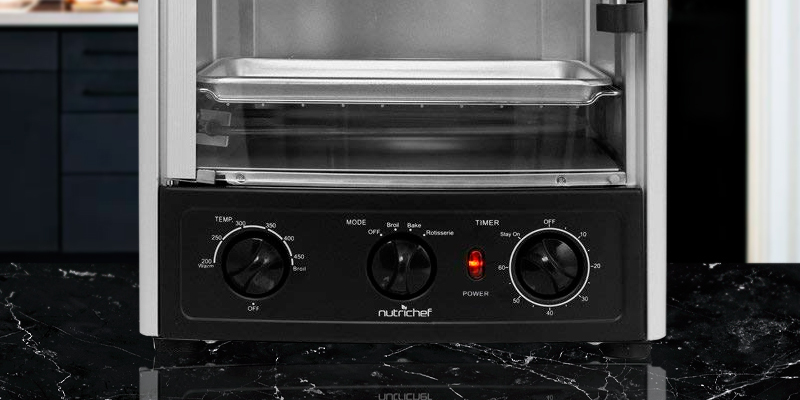 Spit roasting a chicken or a duck is super easy with the NutriChef PKRT97. Handy manual controls will allow for easy and precise adjustments. Simple in operation, the appliance requires minimum maintenance. When the unit and the accessories cool down, just wipe its exterior and interior with a damp cloth. You can clean the glass door with warm soapy water and use non-abrasive liquid detergent for stubborn stains. Do not forget to dry all surfaces with a soft dry cloth or paper towel. You can wash baking racks, a baking pan and a drip pan, rotisserie spit and forks in warm soapy water or put them in a dishwasher. To add to its benefits, the NutriChef PKRT97 comes with a set of accessories for prepping mouth-watering dishes. The purchase includes a rotisserie spit and forks, kebob rack and six kebob skewers, two grill racks, and a baking pan, so you will get everything you need for cooking a splendid dinner for your nearest and dearest. Moreover, most standard bakeware can be used with this oven as well (up to 10” wide 7.5” deep rectangular pans and up to a 10” diameter round pans). The Elite ERO-2008S is one of the most functional rotisserie ovens out there. 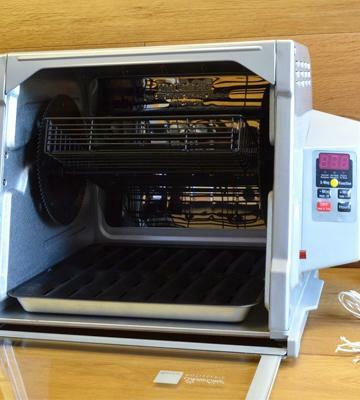 The appliance will allow you to rotisserie, bake, toast, broil, grill, and steam foods, and even keep them warm till serving time. Compact enough to suit even a rather small kitchen countertop, the unit will allow cooking delicious meals for all your family, as well as making up to 12" inch pizzas, thanks to its elaborate design. 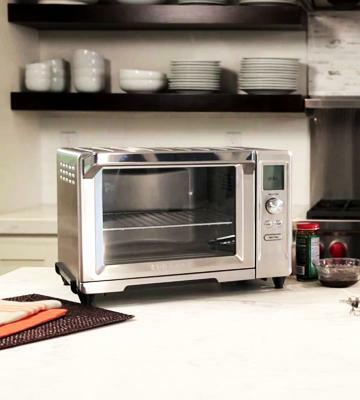 You can use the appliance as a rotisserie, baking, broiler, roaster oven, and even more: in addition to the oven itself, this model is equipped with a cooking surface on its top. This grill/griddle has an ergonomic nonstick surface and is equipped with a dome lid so you will be able not only to roast and grill foods in it but also to steam and keep them warm. 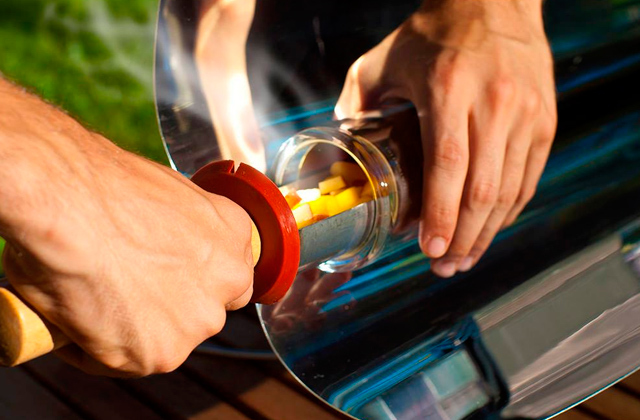 In such a way, you will be able to steam some veggies while cooking a chicken in the oven. Or, you can make some pancakes for dessert while the main dish is being prepared. 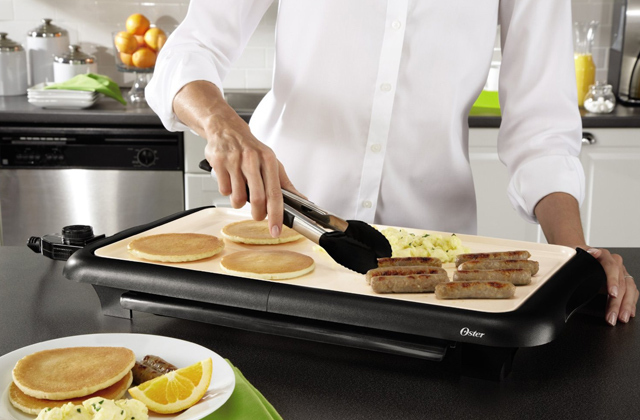 In any case, this griddle will come in handy, especially if you don't have a big stove and need an additional cooking surface. In a word, this Elite oven is not only good for spit cooking; allowing you to prepare the most delicious pastries, broils, and grills, the appliance will help you handle small cooking tasks, like frying eggs or warming foods as well. Operating the Elite ERO-2008S is a snap. Simply preset the cooking temperature and setting and select the desired cooking time. In the instruction manual, you will find rotisserie and broiling guides that will help you choose the right cooking temperature and time for each kind of food. However, the manufacturer recommends using a cooking thermometer for checking the cooking progress of your meat to make sure you roast it to perfection. To make cooking even more convenient, this rotisserie cooker comes with a set of handy accessories. First of all, it has a baking pan and a wire rack that slide easily in and out of the oven, plus a slide-out crumb tray for hustle-free cleaning. Next, the purchase includes an ergonomic rotisserie skewer kit that consists of a skewer, two clamps to hold the poultry and two thumbscrews to secure the clamps that can be adjusted to hold a smaller chicken or other poultry. Finally, you will get a pan removal handle and a pair of rotisserie removal tongs. With all these utensils at hand, preparing toothsome treats will become even easier. 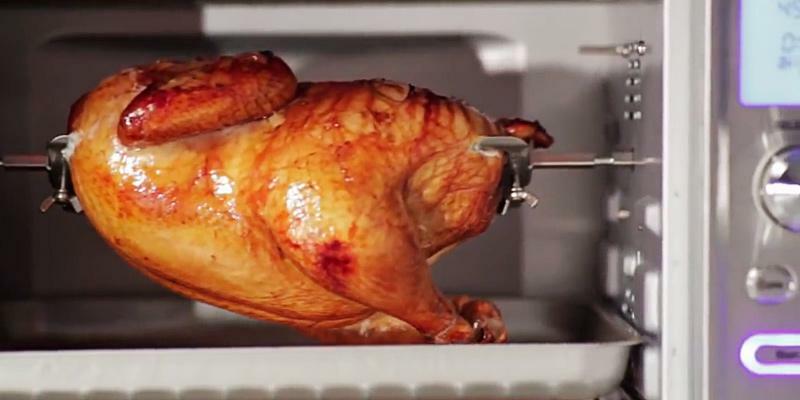 A rotisserie oven is a wonderful invention, allowing you to cook succulent poultry and meat. 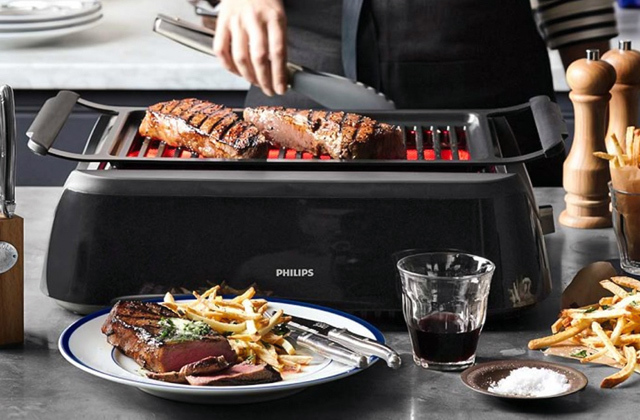 Luckily, today manufacturers provide their kitchen appliances with as many functions as possible, and this vertical rotating grill is not an exception. 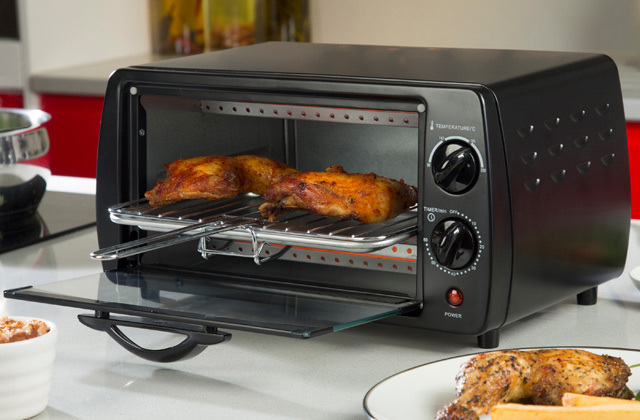 This black and silver model features ergonomic cooking elements that can be adjusted for either horizontal position (toaster oven mode) or a vertical one (rotisserie oven mode), depending on your cooking needs. In other words, you can spit roast a whole chicken (a 24-quart capacity is enough for cooking up to 5 lb poultry), warm pizza, bake and broil a variety of foods. As functional as it is, the rotisserie/toaster oven has an intuitive operation. With three ergonomic dials on its control panel, it takes no time to adjust cooking time and temperature and select the desired cooking mode. The unit's timer can be set for up to 60 minutes. A pretty wide cooking temperature range (200°F - 450°F) will allow you to follow all your recipes with ease. As for the cooking mode, you can choose a bake, broil, or rotisserie setting. 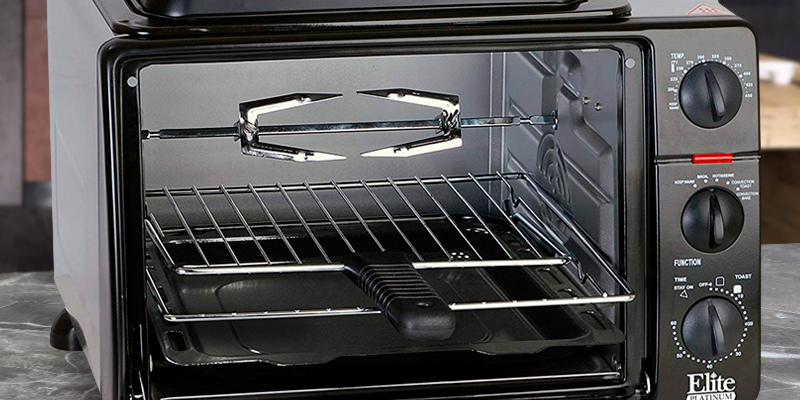 This oven is a compact one, so it won't take much space in your kitchen. The only downside is that its sides and top might get hot during cooking. To ensure safe use, the manufacturer has provided it with a heat-resistant tempered glass door with a handle. This transparent door will help you to observe cooking progress as the goodies you prepare achieve that golden crust. Spit-roasted poultry is both delicious and low in fat, which makes it an excellent family meal. 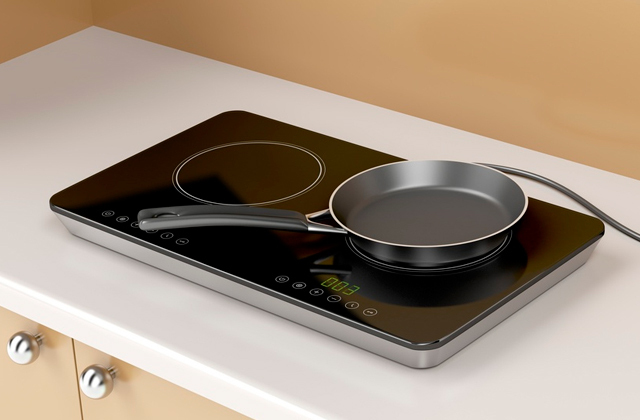 But, as we said earlier, this model is equipped with adjustable heating elements and features several cooking modes so you will be able to prepare a variety of lip-smacking dishes. It will be an easy task because the unit comes with an assortment of baking accessories. 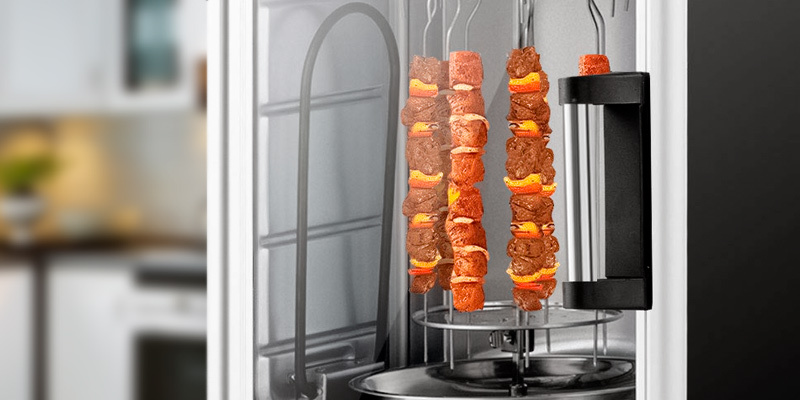 In addition to a rotisserie spit and forks, the purchase includes kebab skewer loading racks and skewers, a drip pan, baking racks, and a baking tray. All the accessories are easy to remove and clean. Summing up, this rotisserie oven for home use is pretty versatile. It will allow you to cook juicy spit-roasted chicken, roasted pork loin, shish kebob, baked potatoes and mushrooms, and many other dishes. So, make sure you've equipped your kitchen with this awesome appliance and pamper your family and friends with delicious, wholesome, and filling meals. A rotisserie oven is an efficient and user-friendly appliance used for cooking healthy and delicious poultry and meat meals. Usually, a rotisserie oven comes with one or two skewers for spit roasting a whole chicken or any other poultry. So, what's the secret of that amazing fragrance and taste lingering over the chicken pieces cooked in a rotisserie oven? Both the taste and the aroma are achieved due to the even distribution of juice along the entire chicken through its slow turning around in the oven. The thing that adds ranks to this oven is that it's not designed strictly to roasting poultry: it can be used for roasting any type of meat as well as seafood and vegetables, making it pretty versatile. Most models come supplied with a wide set of additional accessories which you can use for cooking various recipes letting your culinary creativity run wild. For this review, we've selected the best five models and hope you'll find one that will suit your daily needs perfectly. While on the note of cooking appliances, we'd recommend you to go through our best picks of waffle makers as well as these top-rated coffee machines. 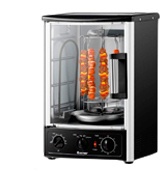 When selecting a chicken rotisserie oven, first things first, you should consider what type of appliance you need. There are two types to choose from: horizontal and vertical. Although horizontal rotisserie ovens look a bit bulky, they are a great option for those who have space on their countertop and seek out a capacious oven that has enough room to accommodate a bigger chicken, turkey, or a chunk of meat. Vertical rotisserie ovens, in turn, have a smaller footprint due to their elongated shape; they take less space on a counter making them a sound choice for those who have small kitchens. In most cases, they have less space inside and can be used for cooking only smaller poultry. That said, both types do a great job of roasting, cooking meat to the exact doneness degree you want and enveloping it in a yummy golden brown crust. 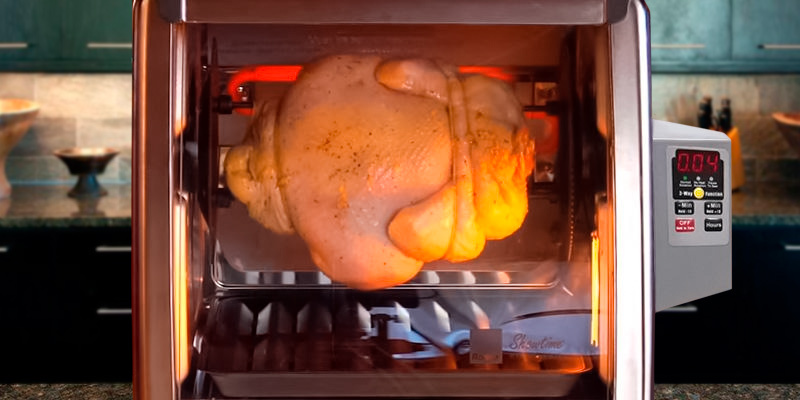 The second feature you should pay attention to when selecting a rotisserie machine is its functionality. Consider its cooking modes - most models include several cooking settings making cooking much easier and often include some manual adjustments providing you with the complete control over the entire process. You can also find models with a built-in thermostat; this will be a useful addition for those users who prefer to adjust temperature settings manually. 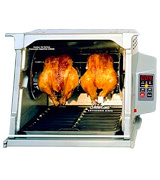 Most rotisserie machines are equipped with an adjustable timer that will allow you to preset the desired cooking time. 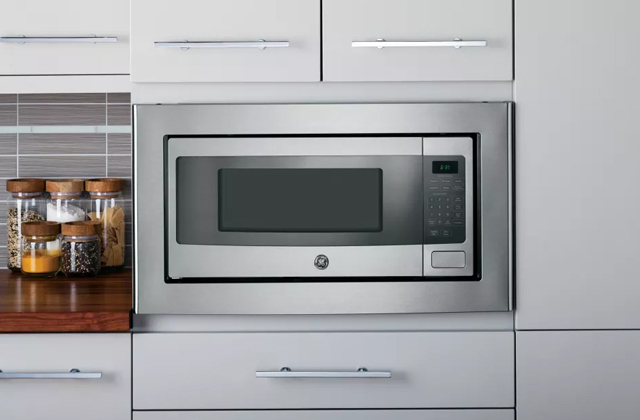 An audio beep signal and an auto-off feature are often added to ensure the most comfortable and safe use of the oven, informing you of the cooking progress and turning the device off in case of improper use. 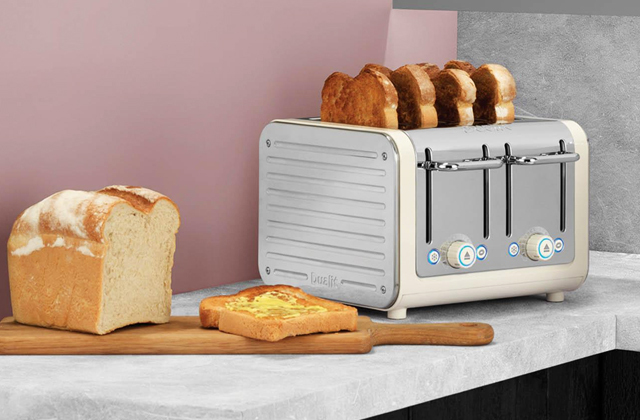 Some sophisticated models boast a convection function which provides hot air circulation for more even baking results and cuts down greatly on the pre-heating time. Go for a powerful oven with at least 1,000-Watt yield to be able to cook not only easy but quickly as well. With a performing rotisserie oven, cooking for a big family will be a breeze. Or, you can opt for a less-powerful but portable oven and use it on a patio or in the backyard throwing fantastic BBQ parties for one and all. 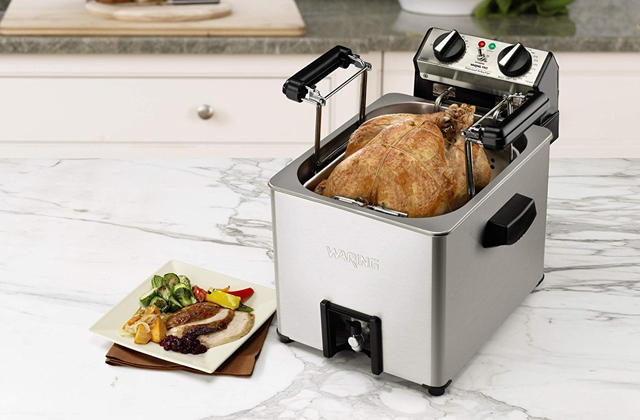 Depending on the included accessories, rotisserie machines can be used for cooking a variety of dishes. Most of them are equipped with a spit and a drip tray to collect excess fat running out of meat. 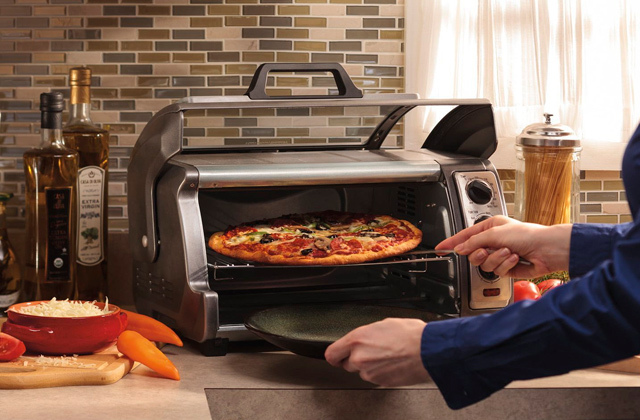 A baking pan and oven rack(s) allow baking pizza, toasts, and smaller pieces of meat. 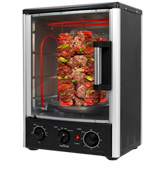 The fans of shish kebab will appreciate having an oven with skewers. Some models are supplied with heat-resistant gloves to enable a more secure way of removing cooked food from the hot unit. If they aren't, you can always buy some separately. A recipe book is another bonus you can find along with some ovens. Rotisserieing is a very special way of roasting food, known for centuries and quite different from other cooking methods. A constant rotation of a spit with a chicken or other poultry or meat allows draining away the fat while keeping the moisture inside. In the end, you get a succulent juicy meat with a low fat content. Besides, when you make a rotisserie chicken at home, you can be sure there are no harmful additives. If properly cooked, it is both healthy and filling and it tastes fantastic. We'd like to share some tips and tricks to help you prepare the most delicious meals in your rotisserie oven. First of all, you need to buy the right whole poultry product. Choose a plump, well-shaped bird and always check the expiry date on the package. Please, keep in mind your rotisserie machine capacity to make sure the bird is not too large to be cooked in it. We also recommend to get fresh poultry rather than frozen. If you want your rotisserie chicken, turkey, or duck to taste like heaven, you should have it properly seasoned. For this, you can use readymade spices, of course, but we recommend making the mixture at home. Homemade seasoning blends are not only less expensive than store-bought ones, but they are also healthier as they contain no artificial preservatives or sugar. Besides, you can vary your chicken seasoning recipe depending on your taste and mood. Most recipes include paprika, garlic and onion powder, black pepper, salt, and cayenne (if you like it spicy). If you are going to spit roast a turkey, you can also add parsley flakes, tarragon, and basil to the mixture. If it is a duck you are cooking, coriander and cumin seeds might serve very well. Again, it all depends on your preferences. As we have mentioned, rotisserieing is a great way of cooking succulent meat. However, there is a way to make your dishes even juicier and tastier. Leave the seasoned meat for a couple of hours and both the taste and texture of the dish will be improved. Just remember to marinate foods in ziplock bags or glass or food grade plastic bowls but not in metal ones or foil. One more important tip is to always put your marinating meat in the fridge to prevent bacteria from growing. Follow your favorite sauce recipes or experiment with new spices to make the most delicious rotisserie delicacies each time you cook. Finally, your chicken, duck, or turkey is ready to go into the oven. Truss the bird and put it on a spit. Most rotisserie machines come with a special kit that includes a spit and a couple of forks and screws. The poultry item should be positioned in the middle of the spit and fixed with the forks. You will find more detailed information (and probably a selection of tasty recipes) in your appliance's user manual. 1. Rotisserie, Wikipedia. September 25, 2016. 2. Rotisserie Oven Buyers' Guide, KaTom. August 2015. 3. A.J. Andrews What Meats Can Be Cooked in a Rotisserie Oven? Leaf. 5. Food storage – how long you can keep chicken breasts/pieces/wings – fresh, raw, StillTasty. 6. Chicken Buyer's Guide, WebMD. 7. Jenet Rausa Fuller How to Buy Whole Chickens Like a Pro, Epicurious. June 17, 2015. 8. How to Buy Chicken, wikiHow.